Book your Hen Party Meath Weekend with us today and we will provide you with the best Hen Party Meath weekend at a great price. 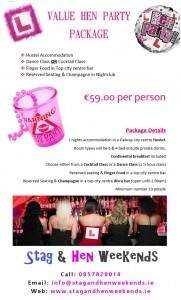 We are Ireland’s number one party organiser; we have been organising quality Hen Parties for over 5 years. We are here to help you plan a great Hen Party and insure you have a hassle free fun weekend with unforgettable memories.